Not a whole lot on DC Comics's first hardcover and trade paperback collection releases of the year, for April/May/June of 2016 (posted January 2016), but I did note a couple of collections I'd like to pick up. Larger collections of some notable 1990s-2000s Wonder Woman and Supergirl stories are always welcome, and also I'm thrilled the Mike Grell Green Arrow collections have continued (and the more there are, the more tempted I am to pick them up). Said to be a new edition of Batman: War Games Vol. 2 -- and these new printings of the 1990s-2000s Batman crossovers have relatively faithfully added or expanded new material -- but for the most the contents of this as solicited seem to match the original War Games Vol. 2 pretty much exactly. Continuing the reprint of the 2000s Catwoman series, this is a smidgen of the Will Pfeifer run that's never been collected before (issues #50-52), and then the Replacements and It's Only a Movie collections. The sexual politics in this run are a little troubling though it's enjoyable overall; however, I recall it reaches its peak about here or the next volume and the end is more generic Catwoman heist stories. Collects Grayson #9-12, the first annual, and the story from Convergence: Hawkman. Three trades in and only 12 issues feels a bit slow; I'd have liked to see up to issue #12 by the second trade perhaps. Continuing the Mike Grell collections. This one has some interesting callbacks to Longbow Hunters and also appearances by prominent Arrow characters (in original form). So glad these collections are proceeding; one of these days I'm just going to do a read-through of this whole thing. I've liked the irreverent Harley Quinn series more and more with each volume, though the third volume was just three regular issues, albeit with a very good annual and two holiday specials. I was eager for the fourth volume, said to collect eight regular issues and a special. As solicited now, however, it's just five issues and a special; that's not bad but it's less than I'd hoped. As a couple people have pointed out to me online, the fact that this says "Book One" now is a good sign that maybe DC will collect more of this beyond Peter David's initial issues with Gary Frank and into Leonard Kirk and etc. Which only makes sense given Supergirl's current prominence. This basically follows the original collection of this material -- issues #1-9 and Showcase '98 -- but now also includes a "Legends of the Dead Earth" annual with stories by Chuck Dixon, Barbara and Karl Kesel, and others, and the Supergirl Plus team-up with Mary Marvel by David. More than the "earth angel" material that would come later, these first nine issues are an interesting set-up for a Supergirl series, essentially a Buffy the Vampire Slayer/"evil things going on in town" kind of story that would probably appeal to today's audiences. At the same time, what DC is waiting on to release a big omnibus edition of Sterling Gates's Supergirl, I don't know, given it's about as close to the TV series as anything in DC's arsenal right now. Includes issues #18-24 and the sneak peek story from Convergence: The Flash. 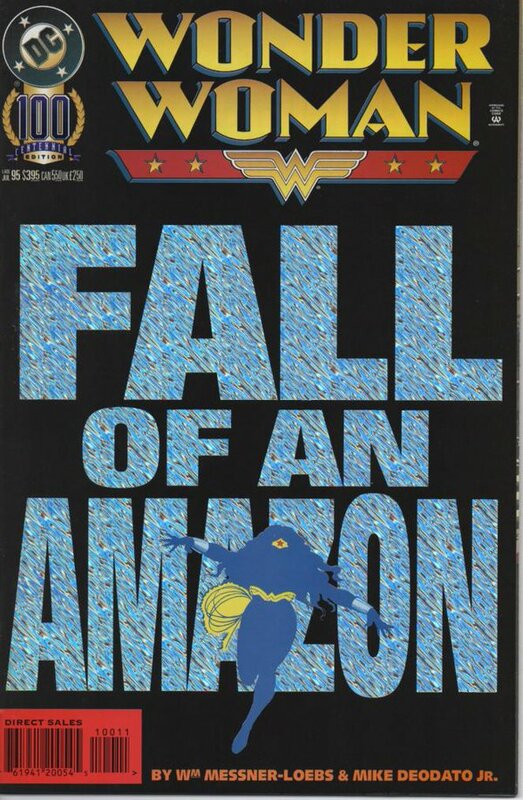 I still find this an oddly-titled collection, being essentially a combination of Wonder Woman: The Contest and Challenge of Artemis with one other issue thrown in, being so much more than just an artist showcase book, but whatever gets people in the door. The #100 issue of Wonder Woman's post-Crisis series collected here, by the way, fell at the same time as a number of other new post-Crisis series, including Superman, Flash, and Green Arrow, at least, if I remember correctly, and DC did a special cover dress for them all (maybe Justice League, too?). The Wonder Woman story, though Deodato's art is heavily of the 1990s era, was enjoyable with some twists to it; the Flash story of the time was "Terminal Velocity," one of Mark Waid's many good ones from that era. What are you thinking of buying? What is a "Rebirth," anyway? It is quite obvious (looking at the page count and price) that War Games will have Acts 2 and 3 (solicitation has parts of both). On the never-collected-before front it would be the two epilogues from Batman #634 and Detective Comics #800. That should still leave room for four-part War Crimes, unless that's left out (for another expanded collection maybe) for something else, but I don't know what it would be. I think one issue of Gotham Central can be considered a War Games tie-in. Maybe there is a Secret Files too or soemthing else? I'd hope War Crimes might be in there (though that came later, I think, and if DC's reprinting that era sequentially, maybe it would be part of another book). I also wouldn't mind if a later story or flashback from Robin (a Robin special?) came in -- a "this is what happened" and then "this is what really happened" kind of thing. War Crimes can really either be with War Games or on its own - it was published between the issues of Winnick's Under the Red Hood in Batman and Lapham's City of Crime in Detective. It would look random lumped with either, and Under the Red Hood "complete" collection is already out anyway (so is City of Crime, altough that one's one of those older books). There's also one more Batman issue by Andersen Gabrych in there, it's not part of War Crimes or anything else, which is probably why it's always being left out. Last I checked, the page count for this new Volume 2 adds up to the page count of the old Act Two, Act Three and War Crimes trades. I think it's a pretty safe bet it's going to be those 3 trades together. No idea if any never-before-collected material might sneak in though. Interesting. I've been debating whether or not to start reading Green Arrow comics. I've read a lot of issues where he makes guest appearances in other titles, which I really liked, but I don't think I've ever read a straight up Green Arrow title. Same thing with supergirl, and that book one listed above does sound like a good starting place. On the sidenote about DC Rebirth, I think they're bringing back a character like they did with GL and Flash rather than a full on reboot/renumbering or whatever the rumors at this point are. Either way, I have faith in DC and will wait with bated breath. When people talk about the Green Arrow title being good, they talk about the Mike Grell era. And tonally -- urban vigilante-wise, not so much CW drama-wise -- it's as close to Arrow as you'll find in the comics. Personally, I was happy to finally see a second volume of the Justice League of America omnibus. It's nice to be able to replace those awfully-dressed Archive editions. :) Hope the sales warrant a continuation of the omnibus series. I had given up hope that this one would ever see the light of day. *Doctor Strange: The Way of the Weird HC and The Mighty Thor: Thunder in her Veins HC--I'm really close to breaking my "no five $25" pledge on these two; Comixology will hopefully come through in the near future. The new Doctor Strange title in particular looks very good. *Spider-Man by Todd McFarlane Omnibus--Because somebody demanded it, I'm sure. Plus it's got a team-up with Liefeld's X-Force. *Marvel Masterworks: The Incredible Hulk Vol. 10 HC--The issues leading up to the first appearance of Wolverine have probably been collected somewhere before, but this is a cool chance to read that famous issue in context. Plus all of the artwork is from Herb Trimpe, one of the best Hulk artists. *Spider-Man/Deadpool Vol. 0: Don't Call It A Comeback TP--If you already have the Joe Kelly Deadpool omnibus, then you already own half of these stories collecting all of the team-ups between the characters as a preview of Kelly's new series. I'm not sure the others are worth paying extra for and they've all been collected in different trades before. *ANAD Trades I'll be picking up: All-New Inhumans, Howard the Duck, Spider-Gwen, Daredevil (I already get Ant-Man and Carnage monthly). *Punisher: Born--Nicely timed for a release around Frank's debut on "Daredevil", this is Garth Ennis' prequel explaining just how bad 'Nam was and how it led to the Punisher's creation. I understand it's really dark, even for an Ennis book. *Avengers Epic Collection: Under Siege TP--If you haven't gotten this before, either in its own trade or the Roger Stern Omnibus, then the greatest Avengers story ever told is a must-buy. *X-Men: Mutant Genesis 2.0 TP--It took me a while to figure out what this is; it's the first seven issues of Claremont and Lee's X-Men remastered and recolored much like the Simonson Thor trades. I actually want to get this since the '92 animated series is a personal favorite and this is the direct inspiration. *Avengers/Iron Man: Force Works TP--Are you freaking kidding? I think I must have missed a release somewhere, because a full Force Works trade getting released before a Hulkbuster/Crash and Burn is pretty damn ridiculous. As much as I love the Modular Era I'm going to take a pass on this. *X-Factor: Genesis and Apocalypse TP--This combines the "Phoenix Rising" trade with the first one or two X-Factor trades, a handy compilation if you're getting into the 80s X-books. As a sign of bigger things, this is actually a tie-in with X-Men: Apocalypse, so maybe things are finally cooling down between Fox and Disney. There is no Roger Stern Avengers Omnibus. There are no first one or two X-Factor trades either. X-Factor: Genesis and Apocalypse is in fact the first X-Factor trade, as most of this has never been collected before outside of an Essential. And I honestly thought there were X-Factor trades from before the Peter David era. I guess the closest was a couple of issues in the Mutant Massacre trade and other crossover collections. *Fight Club 2 HC--I'd be breaking the rules if I talked about this but I hear it's kind of weird. *How To Talk To Girls At Parties HC--Dark Horse has a thing for adapting Neil Gaiman stories, and this is no different, with the creative team of Gabriel Ba and Fabio Moon bringing a teenage horror story to life. *Apocrypha Now! TP--I was looking for the previous book in this volume, "God Is Disappointed In You" and wasn't able to get it in bookstores. Now I might want to wait and get the two-pack. *The Goddamned Vol. 1--Conversely, the solicit directly below "The Covenant" is this Jason Aaron/R.M. Guera collaboration about the wicked Antediluvian Earth right before the Great Flood. Now that's how you do a high-concept Biblical riff. Didn't volume 2 of Grayson had had already collected the Annual #1? I think there's a mistake in the DC Comics page and it actually should be Annual #2. Annuals always confuse me. 2015 #1 but then next year it's 2016 #1 for the same title. Just weird. 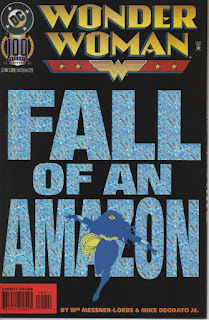 I think that used to be true, maybe in the era of crossover events in annuals, but I'm not sure it's so true any more (except in the case where a book is launched, has one annual, and then is relaunched again the next year). A more accurate confusion, I think, is that DC no longer just publishes one annual for a book per year, but rather sometimes it seems like books get two or three annuals a year. I don't think any book at DC has gotten two or three a year. Batman has had four Annuals in four years, and that's the most any New 52 series has had. Grayson got two Annuals because it's in an unusual situation in which it has two writers trading off scripts, both of whom are capable of writing solo. I did say "seems like." :-) Grayson and Green Lantern each had an annual in December and then another in the following September. That's not the same year, technically, but maybe more accurately I should have said that trades with an annual included every one-two volumes seems spaced closer together than it used to be. One day, I'm going to wake up and see The Atlantis Chronicles on here, instead of a different Peter David collection. Yes. Start stumping for that on Dan DiDio's Facebook page now, ahead of the Aquaman movie. I'd love it if DC did an Aquaman line similar to the upcoming PAD/Frank/Kirk Supergirl series but started it with a Book Zero collecting Atlantis Chronicles and Time & Tide. We absolutely need the PAD Aquaman line starting w/ Atlantis Chronicles & Time & Tide! Is the Fight Club 2 HC the whole story, or are they continuing it after that?